–Difficulties, as well as Disapproval and Dismissal by the MSM during the investigation. How did the supermarket checkout staple, The National Enquirer, scoop the combined forces of CNN, CBS, ABC, NBC, Fox News, Time Magazine, Newsweek, USA Today, New York Times and the rest of the mainstream press in the John Edwards-Rielle Hunter Love Child affair? Perel, who was promoted to Editor-in-Chief of the Enquirer in 2005, has overseen the John Edwards Scandal investigation from the very start and provided DBKP with some interesting insights on Edwards, the Love Child Scandal and the Mainstream Media. Mondoreb: Hi David, congratulations on the National Enquirer’s scoop of the mainstream press–again. David Perel: Thank you. It was nice to finally have the “smoking gun”. Mondo: This story has been on-going over the last–what–ten months? DP: Yes, something like that. Certainly, it’s taken some time. 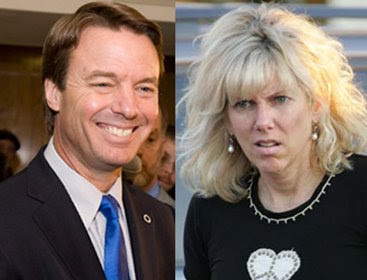 Mondo: Do you feel vindicated by the latest turn of events in the John Edwards Love Child Story–after the Enquirer’s reporters cornered Edwards in the Beverly Hilton? DP: Absolutely. We’d gotten information and tips that Edwards was seeing Rielle Hunter and the baby. On Monday, we got some good intel that there was going to be a meeting at the Beverly Hilton hotel and we got the information in time to get everyone in place when it happened. We had a big team on it. * Over 35 stories on the John Edwards Love Child Scandal, from the beginning. Mondo: I seem to remember that back in December, when the Enquirer broke the second installment of the Edwards scandal, that you had seven reporters working on the story then. How many did you have at the Beverly Hilton this time? DP: There were seven on this story, also. Mondo: It’s been over ten months since the Enquirer broke the Edwards scandal; seven-plus months since the December story that named Rielle Hunter as the “other woman” and showed her visibly pregnant. What was the Enquirer doing in the last seven months that the major press organizations could have been doing, but didn’t, that allowed you scoop them? DP: We stayed on the story. We did it the old-fashioned way, with lots of legwork. We did what the major news organizations used to do: we knocked on doors, ran down leads and talked to people. Mondo: Why do you think the “major news organizations” didn’t do this? 9 users commented in " John Edwards Rielle Hunter: Interview with David Perel, Editor-in-Chief, Natl. Enquirer "
Not to worry, you will be able to take Edwards’ silence as his assent. The story is as true as glue. The report didn’t say they left the hotel together. It said they left the room together. Expect pix Thursday of a balcony shot. Of course, doesn’t sound like that will convince you, either. Thanks for taking the time to stop by, read and comment. Of course the story is ridiculous. I keep hearing about the ‘photographer’ that he ran in to. Well, I’m no Larry Flynn, but if I had seven people being paid for a story like that and the photographer didn’t get ONE photo, I’d be mad as hell. Then, there is the little ‘fact’ that they quote ‘sources’ as saying that she had ‘private time with Edwards’. Who the hell were the sources? The baby can’t talk, he didn’t and that only left her and her ‘friend’ according to this crap. How concocted can you get! Alan Butterfield is the Enquirer reporter claiming to have witnessed Edwards in the hotel for a rendezvous with his alleged mistress. “Concocted” might be a good word for the elaborate cover-up which moved Hunter to within 5 miles of the watchful eyes at Edwards campaign HQ last fall in Chapel Hill, NC. Coincidence? Read up on the many facts (we’ve spent hours on the phone verifying some of them) that are already part of the record and then get back to me. Thanks both for taking the time to stop by, read and comment. I see your real quick to respond with words and no proof. Yeah, maybe all this is true, but, you list me some men you know that hasn’t been here before. All men cheat!!!! DAH! Why aren’t you just putting everybodies business out there. You mention all the major scandals you have reported about over the years…but riddle me this…Where are your crews of people while our current President is robbing us, killing us, and taking our country down for the benefit of his own family!!! You have such manpower for small fries…are you afraid of the “big guns”? What about Cocaine One or Cocaine Two for that matter? Dig up something on that? There is so much to all of that going back to the 50’s…but this is public and they might get me. So, for now, impress me with something more than what men usually do with themselves. This is how the Chairman, David Pecker, and Editor, David Perel of the National Enquirer register to vote. One of the two has a concealed weapons permit.